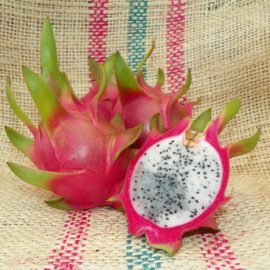 Connie Mayer Dragon Fruit is a hybrid variety that comes from Hylocereus stenopterus and Hylocereus undatus. It is one of three hybrids created by German hybridizer Eckhard Meier. The other two varieties are Bruni and Kathie Van Arum. These are also offered on our online store. The growth is tinder large three-sided that is typical of Hylocereus. Spines are often a single thorn similar to the Bruni variety. The flower is a medium-sized bloom with inner petals being purple shading to light pink edges and white tips. The flower bud is equally impressive as the flower. In Louisiana, the flower opens at dusk and closes at sunrise. When compared to other varieties this is much earlier. Fruits are small and plentiful weighing between 7 and 9 ounces. The green skin when ripe has a transparent pink color with lemon-lime green fins and white flesh. The longer the fruit is on the vine the sweeter it gets. In Louisiana, this took 45 days compared 30 days from other Hylocereus. 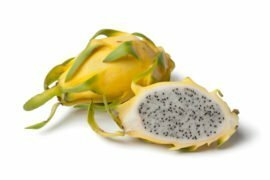 First fruit in 2018 tested with a Brix rating of 20. The flavor profile was floral with a sweet coconut taste, very yummy. We would say it’s like eating a Bruni and Kathie Van Arm fruit at the same time. 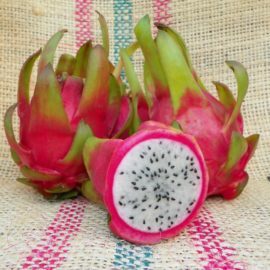 This variety was acquired from a tropical grower in California who had this variety since 2000 soon after Connie Mayer was found and registered.